Enhanced nutritional standards to be set for minors and pregnant women in custody | Russian Legal Information Agency (RAPSI). 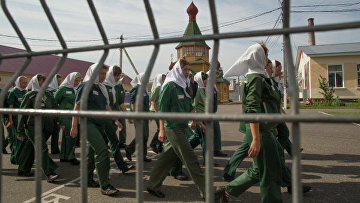 MOSCOW, October 4 (RAPSI) – The Justice Ministry has issued an order to set enhanced nutritional standards for pregnant women, nursing mothers and minors held in penitentiary facilities, a statement on the website of Russian ombudsman Tatyana Moskalkova reads. Earlier, Moskalkova received a complaint from inmates, including pregnant and lactating women, minors and disabled persons, demanding to improve food standards. Moreover, an executive secretary of Moscow’s public monitoring committee reported gaps in the Justice Ministry’s decree regulating nutritional standards in penitentiary facilities, according to the press release. The human rights commissioner has passed the received information to the Federal Penitentiary Service. Following that, the Justice Ministry issued the order prescribing establishment of enhanced nutritional standards, human diet and product substitution standards for the abovementioned categories of convicts and defendants held in penitentiary facilities. 16:42 04/10/2018 The Justice Ministry has issued an order to set enhanced nutritional standards for pregnant women, nursing mothers and minors held in penitentiary facilities.